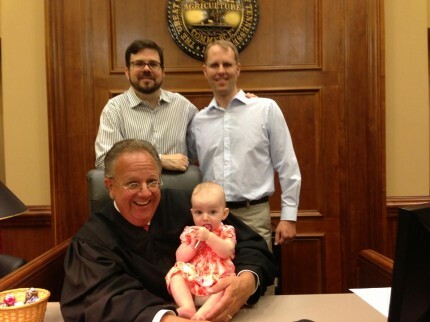 Congratulations to Nashville Gay Parents group members Tom Kraft and Joe Branham on the finalization of their daughter’s adoption on Tuesday, August 6, 2013 in the District IV Court of Davidson County. Rachel Anne Branham-Kraft is proud to call Tom and Joe “Fathers,” officially. If you’d like to share YOUR adoption photo with the group, please send it to brian@nashvilleandbeyond.com.